AnyIndo – In these weeks, our team is focus to create tutorials to Fix Asus Zenfone 2 Bootloop because there are many reports that this topic appears so many times on Google search. 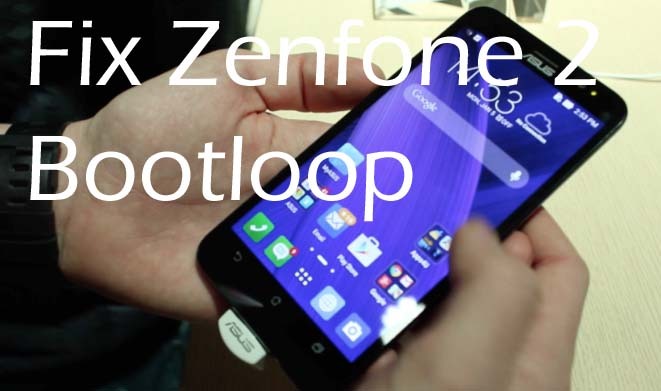 We know bootloop is a serious problem faced by android users, and this happens not the only to zenfone user but most of android user has faced this problem if they are android geek. We’ve told our visitor that bootloop is a circumstance where your android device stucked on android logo and it can’t be operated if you just turn on, turn off or pressing its button. Bootloop zenfone 2 is annoying, especially if you the only have this one device to accompany your activity and you don’t have plenty money to buy the new one. There some reasons causes your android getting bootloop such as failed when you root, install something or it goes to the damage accidentally by doing something on your android device. You may go to the service center to repair it, but as you know, it takes your money to pay it and you have to go outside to handle this. Of course, you feel lazy to go outside if you are not someone who like to enjoying outside the home. If some people with forced forget their device because of this, we recommend you to think twice before you buy new android smartphone. Bootloop doesn’t require the user to repair it go to the service center, because it is just about software damaged. You can solve this problem by yourself if you are confident and dare to fix this. The best method to fix this is by flashing asus zenfone 2, and in this article we would like to guide you step by step to flash your device via ADB. By following this tutorial you are ready to read and follow the instruction carefully. We have no any responsibility to anything happens on your your device. We never force anyone to follow our article, but we will guide them if they are indeed want to follow our tutorial. Download all file above, except ''asus zenfone 2 firmware''. You have to specify in which version your zenfone 2 is, and then download one of them. Go to recovery mode, it is by holding power + volume up button for few seconds. it is called fastboot mode. and then press ''Recovery'', you can use volume button to navigate it and power button to select it. By doing this, you will see ASUS logo on the display, and then changes to be an android baby robot. Press volume down button, always press it and then click volume up button. Till in this session, you will see the display named recovery mode, use volume button to navigate and select wipe data/ factory reset, press button power to confirm it. It will automatically restore the factory settings. After all is completed you'll see the language settings on the screen. Select apply update from ADB. Connect your device to PC vua USB. Check the connection with ADB , if the connection is successful it will become the list of zenfone 2 device. Type adb sideload file.zip (.zip, apk, or .exe are specified to file name of the firmware you downloaded before). Your device will automatically clean all the data and file to return as factory settings. This method can be used also to unroot or downgrade your device, but this will lose your data and file. This is the final method if finally you want to fix your device without go to service center. That's all about the best method to fix bootloop.You can leave comment bellow if you have any question related to this article. Don't forget to request article if you really want to solve problem on your device if we know how to solve your problem. We are always ready to help our visitor. Belum ada tanggapan untuk "Fix Asus Zenfone 2 Bootloop "